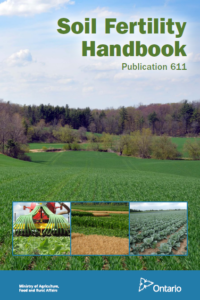 Did you know that OMAFRA has a handbook that’s all about nutrients and soil fertility? It’s called the Soil Fertility Handbook and was first published in 1998. The book covers topics such as soil testing, soil pH and lime and fertilizer application. There’s a chapter on organic nutrient sources, like manure, biosolids and cover crops, as well as tips for identifying nutrient deficiencies in the field. It’s comprehensive and written in plain language. The Soil Fertility Handbook is often included as reading in university courses, but it can just as easily be used as a handy, everyday guide. The third edition of OMAFRA’s Soil Fertility Handbook has just been released! It has a number of new features, including an added introductory chapter on The Nature of Soils and Soil Fertility. The new handbook has completely updated graphics and 25 brand new tables and figures. It answers many of the most commonly asked questions related to crops and nutrients, such as why some soils hold nutrients more easily than others and how fertilizer recommendations are developed. The book includes examples from both field and horticultural crops throughout. It continues to be an authoritative guide on soil fertility concepts. How can you find a copy? If you would like a copy of the Soil Fertility Handbook, you have a few options. You can download a PDF version for free from the OMAFRA website or you can order a hard copy for $20 plus tax and shipping from Service Ontario. A lower quality version is also available from Blurb. The PDF version includes all-colour figures, while the hard copy is black-and-white except for nutrient deficiency photos (note: the Blurb version does not have colour nutrient deficiency photos). The Soil Fertility Handbook is an essential resource for farmers, agronomists and students – download or order your copy today! This entry was posted in All Specialty Crops and tagged all specialty crops, Fertility, publications. Bookmark the permalink.